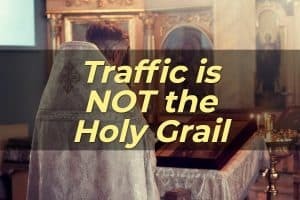 If I get one more offer in my inbox telling me how to free traffic I’ll… well, I guess I’ll do what I’ve been doing – delete it. Second, a lack of traffic isn’t the problem for 99% of marketers. Nope. Traffic can be bought in a heartbeat. Get out the credit card and buy solo ads and AdWords and Facebook ads and so forth until your card melts and you’ll be rich, right?